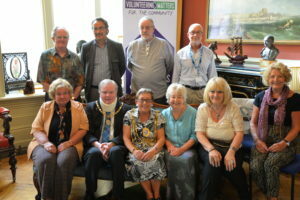 A number of our volunteers accepted a very kind invitation from Councillor Mo Marsh, The Mayor of the City of Brighton and Hove to attend a Tea Party in her spectacular Parlour on June 8th. 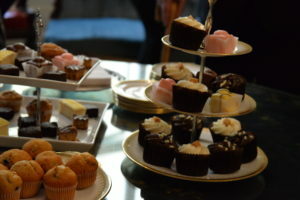 We were all treated to a delicious assortment of cakes, hot and cold drinks, followed by welcome speeches from The Mayor and Volunteering Matters employees Emma Thomas-Hancock, Director of Volunteering and Chris Martin, Project Manager. 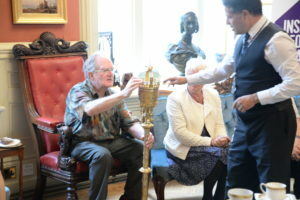 The Mayor’s Mace Bearer, Robert Robertson then entertained and fascinated us all with a presentation around the history of the city. We all got to see some of the regalia and the maces first hand, which was quite an experience! What a big job it must be keep them all so bright and shiny! We are most grateful to Councillor Mo Marsh for hosting a very special event. We all really welcomed this opportunity in Volunteers Week to say a special thank you not only to the volunteers present but all our other volunteers for all their sterling work. This year, we have successfully grown our project across “The Deans” and are going from strength to strength with our Healthlink project, recruiting new volunteers to support people aged 50 plus to attend health related appointments. Our long standing East Brighton work is also expanding into new sheltered housing schemes. We are particularly delighted to be working with Southern Housing, specifically at Courtney King House and are very excited to be the lead partner for the pending opening of Brooke Mead. This is an extra care housing scheme, run by Brighton & Hove City Council and will focus on supporting people who are living with dementia. Alongside our partners Fabrica and Open Strings, Lifelines will be recruiting volunteers to run dementia friendly activities, including Mindful Colouring and Reminiscence discussion groups. Celebrate Volunteers’ Week with LifeLines! 1st – 7th June 2017 is week is Volunteers’ Week. What better time to join us here at LifeLines?! LifeLines is a project run by Volunteering Matters, the UK’s leading volunteering charity which runs a wide range of volunteering and social action programmes across the UK. LifeLines helps people to increase their physical activity, get out of the house more, socialise and make new friends. You’ll be helping to reduce the loneliness and isolation that many older people can experience and as well as helping others, there lots of benefits to being a volunteer for you too. So celebrate #volunteersweek by getting involved and see what difference volunteering can to your life and to your community! Whether you want to start up a new group for older people or help out on a 1-1 basis, we will provide the support and training that you need. I’m not sure, I’d prefer to talk to someone at LifeLines first. PrimeTime at Volunteering Matters is hosting a major event at Brighton Friends Meeting House in Ship Street on Saturday 19th November. Councillor Pete West, the Mayor of Brighton will open the event at 1030 and it will run through the day until 1600. There will be information aimed at men aged 50+ frm a wide range of local parternship organisations with music and lots of different activities. Hot food will be served at lunchtime with hot and cold drinks and snacks throughout the day. You could join our HealthLink scheme and accompany older people to GP surgeries, hospital appointments, dentists, health screenings and other important routine health appointments. If you are 18+ and would like to volunteer and are looking for something that doesn’t require a regular weekly commitment, then the HealthLink volunteer role could be just right for you! Find out more about the HealthLink scheme here. Monthly craft and card making workshop – Monday October 17th Halloween Special! Get creative and make your own greetings cards! LifeLines volunteers will show you how you can make your own greetings cards using a range of arts and crafts materials. Workshops will take place on the 3rd Monday of every month 2.30 – 3.30 at Patching Lodge. Dates for your diary: August 15th / September 19th / October 17th / November 21st. CSV’s LifeLines older men’s cooking group appeared on BBC One “The One Show” on Friday 5 April at 7pm. The “cook, share and eat” older men’s cooking group, part of CSV’s RSVP project LifeLines in Brighton was a huge hit on the popular BBC One “The One Show”. Presenter and food critic Jay Rayner interviewed the group while they cooked a meal for 15 people, our greatest number of guests ever! Jay Rayner seemed to enjoy the meal of Shepherds pie with roasted vegetable topping, and chocolate brownies. Well done to everyone who was involved, especially our four cooks Peter, Carlos, Roger and David. The older men’s cooking group has been running a year and meets monthly. The group is supported by an older volunteer and a food trainer, cooking a three course meal each month. The members invite guests to eat the lunch they have prepared. A great way to welcome new members. Cook, share and eat developed when the LifeLines older men’s cooking course “Old Spice” came to an end after 3 years of affordable and healthy cooking training. The members missed cooking and eating together and decided to be “like Oliver Twist and ask for more”. LifeLines supports older volunteers to run activity groups and give one to one support to older people in the Queens Park area of Brighton. LifeLines older volunteers run groups in Patching Lodge, a Hanover extra care housing scheme which is open to the wider community. The project is run in partnership with Brighton & Hove City Council, NHS Sussex and Hanover Housing Association. We also receive funding from the Big Lottery. Dates for your diary: September 19th / October 17th / November 21st. Gentle Exercise – more classes starting in September! Exercise to help you to get fit in your own time and at your own pace. Shamsul Choudhury is a qualified martial arts instructor/trainer with over 40 years experience. Shamsul has developed this gentle exercise class to help you get active, improve your flexibility and your general fitness. For more details please contact LifeLines on 01273 688117. FREE lessons led by our experienced Dance Teacher and LifeLines volunteer, Dave. Come along and learn some new steps for our monthly Tea Dances, or just to have some fun!